What did his book of martyrdom (Metsehafe Gedlu) say? FOREWORD According to the Ethiopian Orthodox Tewahedo Church's faith, order and education, one of the unique attributes of the Church is the hymnody of St. Yared. St. Yared is an Ethiopian saint who wrote the hymnody of the Church in the 6th century A.D. Inspired by the Holy Spirit and moved by a deep love of the Church, he composed all the hymns of the Church with musical notations. He created special hymns and musical variations for different occasions and seasons. The hymns of saint Yared are original, melodious, uplifting and inspiring. As the hymn is made to glorify and praise God, the cantor who sings it is completely absorbed by the religious tune. It is performed in a humble rapturous mood and with delicate movement. Talking about the deep feeling of joy and the sense of piety it arouses, Church Fathers often describe it as a hymn akin to the song of angels in praise of God. The hymn of St. Yared is the central and most beautiful element of our Orthodox worship. 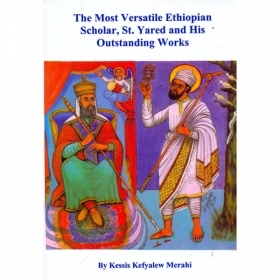 Saint Yared was not only a scholar, he was also a priest. Why do Priests marry? This is because it is written in the law of God. For instance, all priests in the Old Testament were married. That is to say that all priests from Aaron to the Archpriest Zechariah who served the people of God were married. Moreover, the only person who was able to enter in the Holy of Holies was a married priest. Num.18: 1-10. It is also clearly written in the New Testament. St. Paul said, "It is better to marry than to burn." 1 Cor.7: 9,9:5,1 Tem. 3: 1-7. In the Orthodox Tewahedo Church there are two types of priests, and both have the same authority. First of all, priesthood is a vocation, not a profession. For the service of God, the Orthodox clergy have peace of mind and heart to exercise their free choice to be a married priest or to remain a celibate priest. According to hagiography, St. Yared was a married priest with two children. Therefore, there is a little space for spiritual freedom in the Orthodox Tewahedo Church in this context.